Hunter Douglas reaffirms its dedication to creating shades that are both stylish and smart with enhancements to its innovative wireless operating system, PowerView® Motorization. 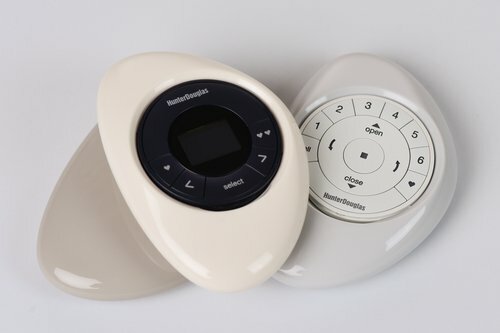 While the system—which enables users to control, time and set their shades to raise, lower, tilt and traverse automatically to suit their schedule—is currently compatible with home automated programs including Nest, Logitech, Savant and more, the new technology is now turbocharged, with added connectivity to industry-leading voice-activated devices from Amazon and Google. And, consumers can look forward to PowerView functionality with Apple® HomeKit™, set to launch later this year. This technology trifecta offers homeowners who desire a smarter, more personalized living environment the power to control privacy, ambiance and energy efficiency with a click of a button or through voice control. While the updated system boasts brains, it is beautiful to boot, with thoughtful design enhancements for each of its components, including the artfully-shaped PowerView® Pebble Controller featuring three new, on-trend colors – Ecru, Oyster and Mist – the PowerView® Hub, PowerView® App, and the PowerView® Repeater. Thanks to these PowerView® Motorization brand enhancements, homeowners have it made in the shade when creating an environment that works with their lifestyles, on their terms and in style.